This is an uplifting story of a woman standing alone in London and contemplating the breakdown of her marriage, the significance of the bells as they start to chime more poignant than ever before. Alice and her children are facing a dismal Christmas in a hostel until a kindly stranger makes her an offer she can hardly believe, one which shows all the magic of Christmas. This is a tale from the point of view of Merlin but I’m afraid to say I rather struggled with it. Ruth is lonely, living in poverty and mourning her husband when an unexpected gift brightens her Christmas. This was a rather sad story of two children living with a mother who was struggling to deal with the loss of her husband. There is a paranormal element for added interest and I enjoyed the story right up until the ending which I was slightly confused by. This was a great non-fiction piece about having a mouse, or mice, in the house – shudder! This was a terribly sad story about a woman who falls in love and the difficulties that brings because of something that happened in her childhood. The struggles this woman faced were really painful to read about and I found myself rooting for life to improve for her. You’ll have to read it for yourself to find out if it did! Aww… This is the tale of the rehoming of a cat, from the cats point of view. I thought this was a sad thing to begin with but was soon shown otherwise and it had a lovely ending. Sally loves her brother Tommy but is worried about him, his bad dreams and his obsession with collecting stones. She starts questioning the past finding more mysteries than answers at first but when all comes clear it doesn’t solve the problems in her family. With mental health being discussed so much more openly nowadays this is an interesting piece on the narrators’ relationship with her own black dog and how it appears to her when needed. Karma is at the centre of this final short story as Danny’s kindness pays off when he suffers a terrible fate after being brave enough to stand up to some older children. This is a nice, if sometimes quite dark, well-written collection of stories that are varied and give a good indication of what you will find in the novels of these two authors. I shall certainly be reading more by them. 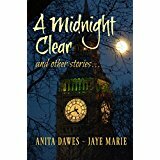 You could have knocked me down with a feather when I spotted your wonderful review of A Midnight Clear this morning. We both thank you from the bottom of our hearts for reviewing our collection of short stories, and hope you enjoy some of our other books as well as you did this one! So do we, and we are so pleased with the response A Midnight Clear is receiving!